Lindsay Drilling uses steel and thermoplastic casing in all the water wells we install. As per state regulations the first 25 feet of every water well is required to be cased in steel and grouted to block any surface water that may leak into the well causing potential contamination. The most common well size in our area is 6″ however, we install 6″ through 24″ wells for domestic, commercial, industrial and agricultural uses. Either bentonite grout or cement grout are used in all of our wells to seal and help prevent unwanted particles from entering into the water system. In addition to drilling water wells, Lindsay Drilling also specializes in constructing a variety of projects including monitor holes, elevator shafts, geothermal holes, de-watering wells, heat pump holes and piling holes. 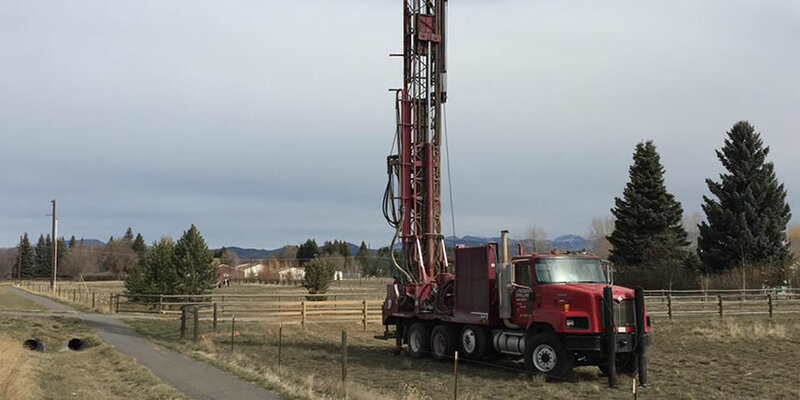 Our drilling specialists travel around Western Montana to perform these services that compliment our general water well drilling business. Before starting a water well, we make every attempt to ascertain our customers’ present and future needs in order to help select the best possible location and size for the well. Although water is never a guarantee, we have the knowledge and resources to research surrounding water wells and their depths to provide you with the most accurate guess for a your potential water well site. After the well has been drilled and the casing and screen have been installed, several methods are used to develop the water producing capabilities of the well. Only when a well is developed to our highest quality standards and satisfaction, do we consider the well to be completed. Our drillers make use of the latest air rotary drilling equipment, as well as the most modern drilling procedures. This, combined with our past experience and knowledge of the geological conditions in the area, we are able to offer you quality constructed projects at an affordable price. The drilling industry is ever growing and we aim to keep up with the always-changing regulations and standards.